How can you avoid manual distractions and stay safer? Americans are busy, and we seem to be getting busier. Ironically, the technology revolution of the last 25 years adds to what we do each day, instead of making our lives easier. When I started practicing law, the fast form of written communication was a fax machine, which stayed at the office. Now I get voicemails emailed to me at 2 a.m., texts and emails anytime, and I can talk to clients from almost anywhere. Advances in technology let us access information and communicate with others constantly, which might be good–unless it happens on the road. There, we know that technology, combined with hectic schedules, often leads to distracted driving. And distracted driving is causing tragic accidents with serious or fatal injuries every day across Virginia. Operating a vehicle brings responsibility. The safety of passengers, people in other cars, and pedestrians should be the driver’s top priority. Unfortunately, this is not always the case. 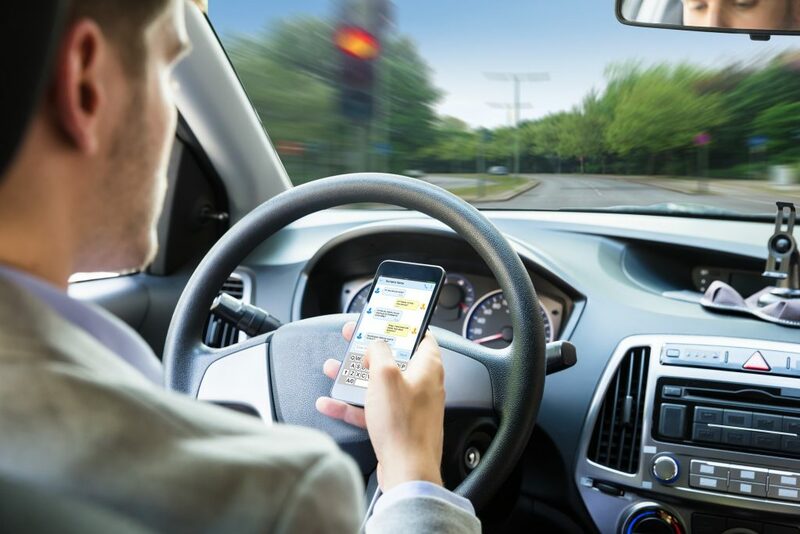 We at GibsonSingleton Virginia Injury Attorneys have launched our “Texts=Wrecks” campaign to remind our fellow Virginians that distracted driving kills. As we’ve written in the past: visual distraction involves a driver taking his eyes off the road; cognitive distraction involves a driver not fully concentrating on driving. Now, let’s explore manual distraction, remembering that texting while driving creates a manual, visual, and cognitive distraction. What is manually distracted driving? Manual distraction happens when a driver takes one or both hands off the steering wheel to do something else. Shifting gears and turning on headlights, turn signals, or windshield wipers are not considered distracted driving. What are common manual distractions? Multitasking behind the wheel is nothing new. As soon as cars were invented, early manual distractions likely included eating and drinking, smoking pipes and cigarettes, adding or removing clothing, reaching for dropped items, and more. Retrieving things from purse, backpack, briefcase, etc. What can manual and other types of distracted driving cause? Distracted driving results in more than 1,000 injuries and approximately nine deaths each day in the United States. 3,477 deaths and 391,000 injuries were caused by distracted driving in the United States in 2015, and teenagers were involved in the majority of fatal accidents. How can you avoid manual distractions when you are driving? Eat, drink, groom, etc., before starting to drive, or after you have stopped. Adjust music before you begin driving, or once you stop. Turn off your phone or make it inaccessible while driving. Program your GPS before you drive, and pull over if you need to adjust it. The good news is: If we take the problem of distracted driving seriously and practice safe, focused driving, our children and teenagers will be safer, and they will see our example. Modeling good driving is the best way to teach our teens and children what we want them to do. What if my loved one or I are hit by a driver who was distracted? First, we are so sorry that you or your family were in an accident. At GibsonSingleton Virginia Injury Attorneys, we work hard to promote safe driving in Virginia, so that no one gets hurt. Unfortunately, not everyone does drive safely. Second, know that we consider it a calling to help those who are hurt as a result of someone else’s unsafe choices. If this is you or a loved one, we stand ready to help you get the money needed to recover and become financially whole. If the at-fault driver’s insurance company refuses to fairly compensate you, we will collect evidence and build your case. As former U.S. Marines, we will work tenaciously throughout your case–until the very end–when you are compensated fairly. When we at GibsonSingleton Virginia Injury Attorneys represent you, we charge no upfront fee. We get paid when we get you the payout you deserve. Call (804) 413-6777 today for a free consultation with our Virginia distracted driving accident attorneys. And remember: keep your hands on the steering wheel, eyes on the road, and mind on the task when driving!